When most people hear the words “Shaw” and “Niagara-on-the-Lake” in the same sentence, they rightfully think of the city’s fantastic Shaw Festival — a repertory theater event that spans months and dozens of excellent plays each and every year. While the Shaw Festival is definitely one of the region’s most prized attractions, it’s just one of many, and just one of many that shares the same name. For fans of theater, a trip to NOTL is always in order during the late spring, summer, and early fall months. For fans of gardens, landscaping, and the beauty of the Earth, a trip to NOTL in June is warranted as well. Here is a closer look at one of the under-heralded but truly remarkable events taking place in Niagara-on-the-Lake this June: The Shaw Guild Garden Tour. 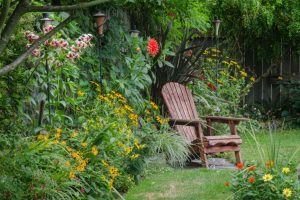 On June 4th, from 10 a.m. to 4 p.m., you can join other lovers of unique and beautiful homes and gardens on a tour of NOTL’s Old Town and some of its best-kept and little-seen gardens. 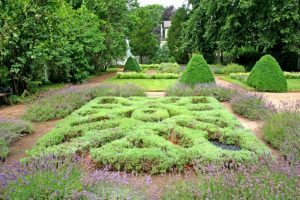 Experience a formal knot garden whose perfectly manicured boxwoods border an acre of pristinely curated and cared for space. Step into a Japanese garden inside a private courtyard with a reflective pond bordered by wisteria, clematis, and more. From outdoor patio spaces crafted with living trees, bushes, and plants to waterfalls and a wide variety of impressive trees and unusual shrubs, the tour boasts eight different private gardens that range from small to large. A one-day-only event, you can experience them all as part of the Shaw Festival’s offerings for the season. Tickets are just $25, and the tour will be a much-loved addition to almost any Niagara vacation itinerary. The Penman Residence. Featuring both an outdoor kitchen and an outdoor dining area that includes perennials like foxglove, peonies, and valerian, this residence also boasts a small, secluded pond. The Todd Residence. This relaxing outdoor space is surrounded by clematis, giant grasses, hydrangeas, yews, and a changing cast of annuals. The McCaughy Residence. From the secret dining area to the waterfall and hot tub, this garden offers a wealth of opportunities to rest in seclusion, while surrounding visitors with hostas, heucheras, Japanese reed grasses, and maple trees. The Thomas Residence. A formal boxwood hedge grants entrance to this beautiful garden where a wealth of trees, grasses, daylilies, hydrangeas, and other perennials await. The Smith Residence. With a pond bordered by coneflower, hostas, and ligularia, this yard also boasts a ginko tree, garden statues, and a lovely lilac display. The Misiak Residence. From the arbor covered in wisteria to the herbs, apple trees, and strawberries, this garden is a perfect blend of eye-candy and eating considerations. The Laroche Residence. With over 100 elegantly shaped boxwoods, raised beds filled with herbs, 100-year-old willows, a formal knot garden, and more, this property one of the region’s most impressive. The Penner Residence. Featuring a Japanese garden along with a stunning courtyard, this space also includes clematis, a reflective pond, peonies, and Japanese Larch trees. Give yourself the garden tour of a lifetime in quaint and charming Niagara-on-the-Lake. The Shaw Guild Garden Tour offers an enduring look at some of the finest, private outdoor spaces in the whole Niagara region.